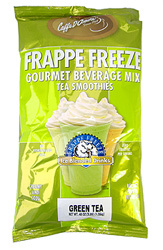 Introducing Caffe D'Amore Frappe Freeze Green Tea Smoothie with Matcha. A light and refreshing Green Tea paired with rich creamy vanilla. What is Matcha? It is a Green Tea highly valued for its rich supply of antioxidants, vitamins and minerals. Grown in the shade, the leaves are harvested, dried and ground into a powder. This process provides the healthy benefits in their natural form. Experience a healthy boost with a 3 lb. bulk bag.